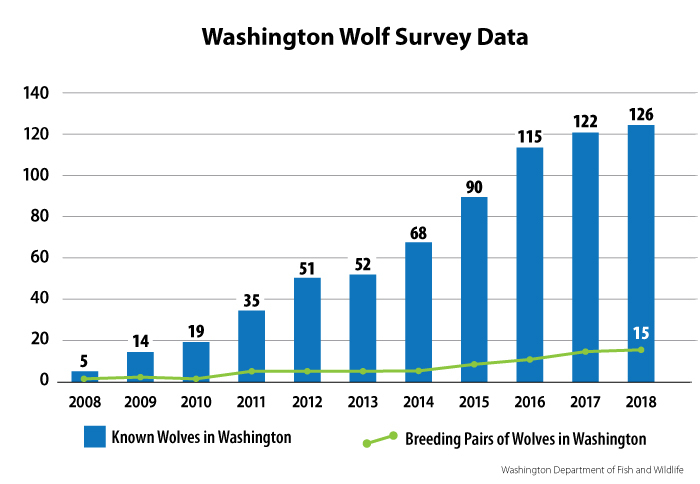 The Washington Department of Fish and Wildlife this week published its annual year-end report, which shows the state has a minimum of 126 individual wolves, 27 packs, and 15 successful breeding pairs – male and female adults who have raised at least two pups that survived through the end of the year. A year ago, those numbers were 122, 22, and 14, respectively. "Packs and breeding pairs are the building blocks of population growth," Martorello said. 'It's reassuring to see our wolf population occupying more areas of the landscape." The report will be reviewed with the state Fish and Wildlife Commission when it meets April 5-6 in Olympia. That meeting and a discussion about the report will be broadcast live at 1:30 p.m. April 5 at https://www.tvw.org/schedule-main/. The survey report will be posted on WDFW's website by April 5 at https://wdfw.wa.gov/species-habitats/at-risk/species-recovery/gray-wolf.